If you wanted to become a lecturer fifty years ago, a post graduate qualification was not necessary, but the career has become so professionalized over the past few decades that now it is nearly impossible to get a permanent lectureship without having completed a PhD. The qualifications that you will need are a good bachelor's degree (2.1 or above), possibly a masters, and for almost all disciplines a PhD in the relevant field. You do not need a separate teaching qualification, although you may be offered the chance to do one while studying for your PhD. Alternatively this may be required during your first year in the lectureship job. Hopefully while doing your PhD you have been planning your future career and working out ways to maximise your chances of getting a job. There are two main aspects to being a lecturer: lecturing (i.e. teaching) and research (with administration running a close, often undesirable, third). Different institutions prioritise research and teaching slightly differently and you need to find out which aspect is most important for the particular job you are interested in. As a general rule for the UK, Russell Group universities prioritise research whereas post-1992 institutions place more emphasis on teaching, but this is only a generalisation. Let us take the question of teaching first. While doing your PhD you may have been offered the chance to do some teaching in your department on an hourly rate. A few universities discourage this, but most have realised that gaining teaching experience is important for future academics. This is usually in the form of seminars or tutorials, but occasionally you will get the chance to contribute towards labs and lectures as well. You may be asked to mark essays and even help mark exam scripts too. This is where you will gain the experience needed to get a permanent lectureship after your PhD. Make sure you do as much as possible to build up your skills portfolio and expand your teaching experience. Without this experience you will find it pretty difficult to secure a teaching job later on. It is wise to take any teaching work if it is offered, even if it seems to be a distraction from the main aims of your PhD. One aspect that many PhD students do not get involved in is curriculum design. Rather, they have to teach courses designed by others and do not have a say in how and what they teach. So if you do get the chance to develop skills in this area, do so, because it will really make you stand out from the crowd. Your PhD will form the main basis of your research experience. If this is successful, it will go a long way to putting you on to the academic career ladder. Most people take 3-4 years to do a PhD full time, so it is a sustained, detailed piece of independent research. After finishing their PhD most scholars turn immediately to having it published either as a book or a series of articles. 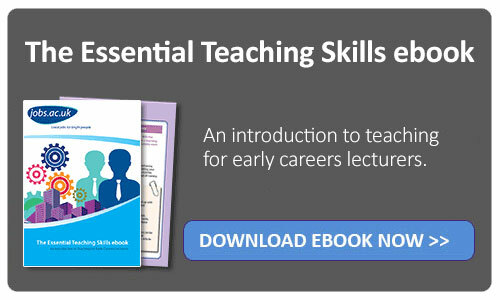 This is also an essential step on the path to becoming a lecturer. You will not be expected to have published a great deal before your PhD is over, but once it is completed you need to build up this side of your CV straight away. Another aspect is being able to communicate your ideas to your peers and colleagues, so giving papers at conferences, workshops and lectures is important too. Employers will want to see that you can disseminate your research and this is one of the best ways of proving that. On finishing their PhD many scholars find it difficult to get a job immediately. They have to work on an hourly paid basis or temporary or part time contracts to make ends meet and gain experience. This can involve travelling a long way to and from work or working at several institutions simultaneously. The increased diversity of your experience will reflect positively on your CV. At the same time it is important to maintain your focus on publishing despite the fact that the contracts you are offered might not have a provision for paying you for this aspect of academic life. This can be a thankless, depressing time in an academic's career and requires focus and dedication. Viewing this time as an extension of your training and skills development will help to get you through it, although this can be a bitter pill to swallow after seven years of study. Some scholars are fortunate and get a job quickly after finishing their PhD; others spend years in and out of temporary positions. Your PhD supervisor, colleagues and friends in academia will all be invaluable in passing on job information via word of mouth. This is an important way of learning which institutions are hiring at any one time and especially useful when a department is looking for a temporary member of staff. Initially the search for a suitable candidate is done by members of the department asking contacts whether they know anyone who would be interested. Only later would the position be advertised more formally. For permanent positions, institutions have to advertise publicly even if they have an internal candidate in consideration for the job. jobs.ac.uk is the key place to find lecturing jobs, advertising over 40,000 jobs a year in all of the major universities in the UK and abroad. Jobs are also advertised on websites and magazines relevant solely to your own field. There are other articles in this Career Development section that deal with issues such as academic CV building and how to maximise your chances of getting these jobs - these are linked to at the end of this article. Academia is very competitive with the most prestigious jobs attracting hundreds of applicants from across the globe. But with persistence and dedication one of those jobs could be yours.